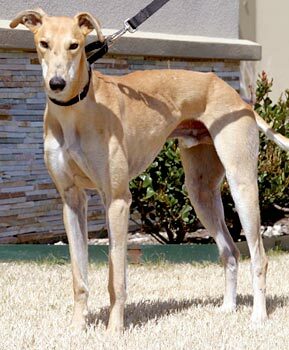 Sailor (formerly Freedom), aka Kingdom Freedom, is a handsome, 3-year-old red fawn male born March 19, 2006. His sire is Kiowa Sweet Trey and his dam is San Tan Hotbomb. Sailor's 13-race career took place all at the Corpus Christi, TX, track ending on December 30, 2007, which was the last day of live racing at that track. In seven of the thirteen races, Sailor came in fourth place or better. Sailor, along with Hardy, was adopted and in a home for almost one year, but unfortunately it was not to be his forever home. Sailor was returned through absolutely no fault of his own. Sailor is cat and small animal tolerant. Sailor would do best in a home with another dog. Canine Casanova - ambassador of good cheer and many kisses - to both people and dogs. Sailor is a dog who likes to be with people and other dogs. Actually Sailor loves, that is LOVES, other dogs. He greets other dogs with kisses and an open mouth "hello." 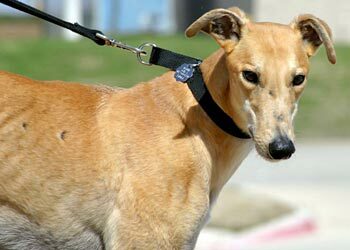 It is clearly non-aggressive, since the other greyhounds that he meets do not seem at all threatened. Some return his open-mouth greeting. Needless to say, it is exceptionally cute. All of this is not to say that Sailor is immediately comfortable in new situations or with strange noises. In fact, Sailor stood at a recent meet and greet with his tail between his legs - until other greyhounds joined him. Then he became his happy, kissy self. In his foster home, all new sounds momentarily produce some anxiety; however, he is also easily reassured. Even when nervous, he'll come to his people for reassurance when called. Sailor has been in a home before, so he knows some good house manners. He does not counter surf. He leaves people alone when they are eating. He is responsive to "leave it" and somewhat to "stay." He waits relatively patiently for his lead prior to walks, and then he walks well on a lead. On a walk the other day, we did discover that Sailor is very interested in squirrels. He thoroughly enjoyed the park. Sailor also truly enjoys riding in the car. It is entirely possible that in his previous home he was permitted to sleep on people furniture, because he often tries to do so in this home. Sailor doesn't play too much with toys, but he loves to collect them, especially if you are interacting with him. He loves to be offered toys with which he proudly constructs "artistic" groupings in several different rooms. He also loves rawhides and other treats. The other wonderful thing about Sailor is his name. It just works. Consider: "Hi, Sailor." or "Hey, Sailor!" or "Wanna go for a ride, Sailor?" or "You have any more nice kisses, Sailor?" You'll enjoy filling in the blanks when Sailor comes to live with you. Sailor knows his name very well, and is very responsive to it. He will interrupt most anything he is doing if he hears someone mention his name. 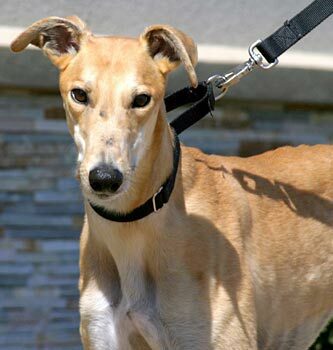 If our greyhound girl is any indication, Sailor will fit easily into another home with dogs. She really likes him, and he, in turn, loves to be with another dog or dogs. It seems like Sailor would make a delightful addition to most any family.